Super simple (15 minutes prep! 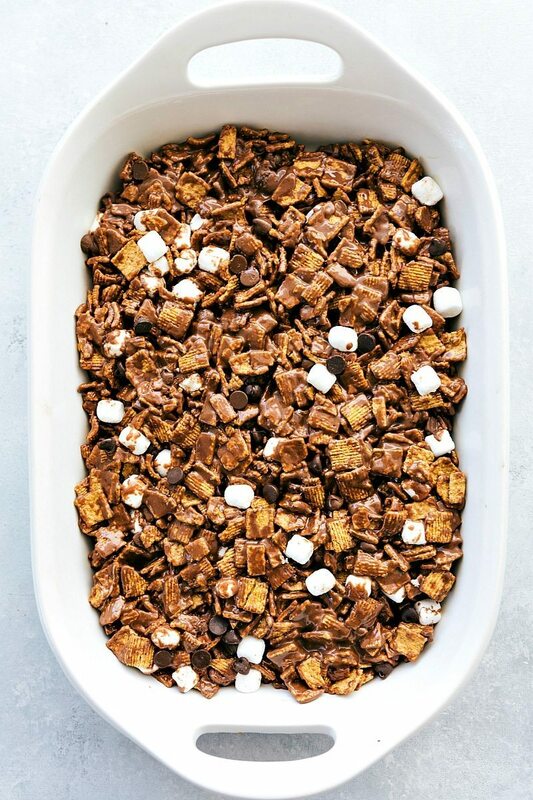 ), no baking required, smores bars — graham cracker flavored cereal, marshmallows, and milk chocolate. After you’ve become obsessed with these smores bars, be sure to try these other no bake desserts: edible cookie dough, delicious muddy buddies, or these cookie dough cups. This dessert is one of my mom’s famous “signature” desserts. 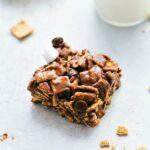 While it’s not technically her original creation (she found the recipe on the back of a box of golden graham cereal), she’s made these for years and is “famous” for them. Everyone that likes smores LOVES these smores bars! They are the first thing to go at a party and she brings these to just about every function she can. They are also consistently one of the first desserts to be devoured. The great news is, they couldn’t be easier to make. No more than 15 minutes prep time, only SIX ingredients, and no baking required! 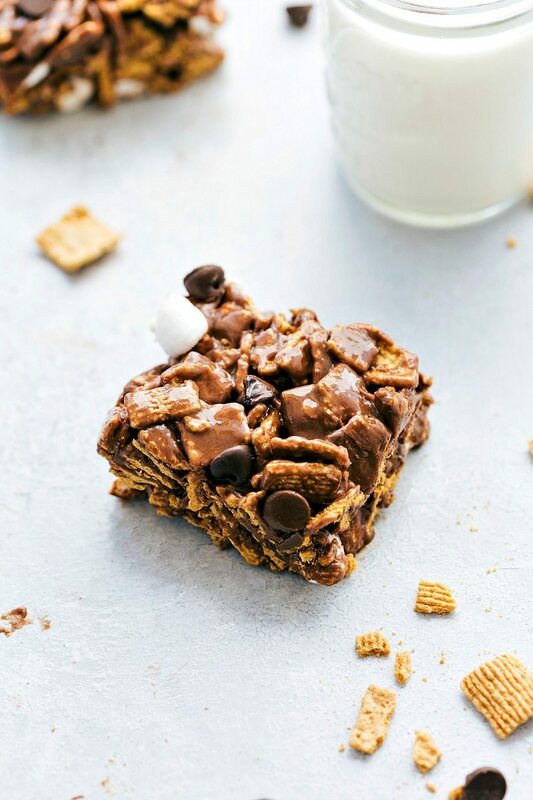 These are definitely the easiest way to get your S’mores fix and it doesn’t even matter what season it is — fall, winter, spring, or summer, these can ALWAYS be made! There are really just two steps — melting most of the ingredients in the microwave and mixing those ingredients together. Step two: pouring that melted mixture over the cereal + remaining ingredients. Once you’ve tossed that all together, they can be put into the pan! And that’s it! All that’s left is waiting for the smores bars to set up and harden a bit. Super simple (10 minutes prep! 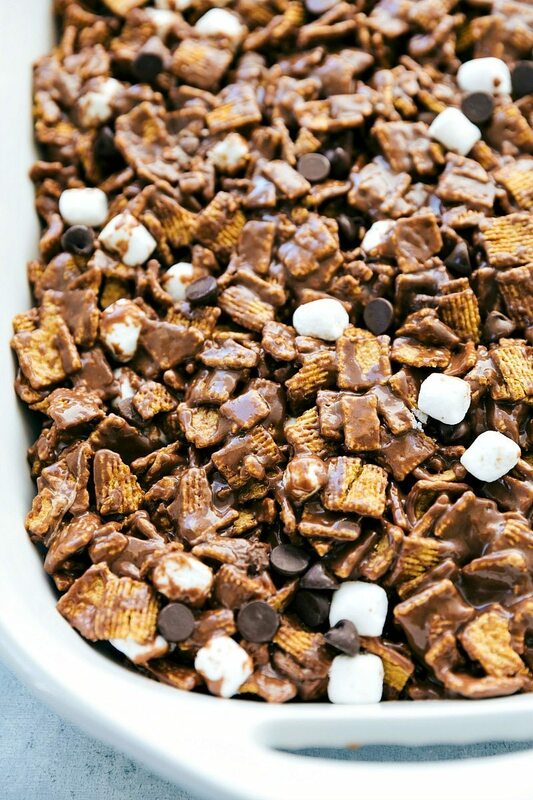 ), no baking required, s'mores bars -- graham cracker flavored cereal, marshmallows, and milk chocolate. Generously grease a 9 x 13 pan and set aside. Place the golden grahams cereal in a very large bowl and set aside. In a very large microwave-safe bowl, add in 5 cups miniature marshmallows, 1 and 1/2 cups chocolate chips, cubed butter, and corn syrup. Stir and then place in the microwave for 2-4 minutes, removing to stir every 20 seconds. When you remove the mixture every 20 seconds, stir for about 10 seconds making sure to really scrape the bottom, and then return to the microwave. Microwave JUST until the mixture is melted and smooth and don't microwave more than needed. Once the mixture is smooth, stir in the vanilla. Pour the mixture over the cereal and gently but quickly toss to combine. Pour in the remaining 1 cup marshmallows and 1/2 cup chocolate chips and stir until just incorporated. Pour into the prepared pan. Spray your hands with cooking spray and then gently press down the bars (Don't press them too hard or it will make the bars hard). Let stand, uncovered, for an hour (refrigerate for firmer bars). Store loosely covered at room temperature for up to 2 days. Hey there! Do you think you can make these without corn syrup, like rice krispie? Have you ever tried? They look delish! Thank you! I haven’t tried them without corn syrup, but I’m sure they’d be okay without it and maybe some extra marshmallows! I loved your recipe so much that I included it in my S’mores recipe round-up. 🙂 Your pictures are great, too! Thank you so much Laura! 🙂 That means a lot to me!